It all happens in ‘A New York Minute.’ That push and pull between the city and our motherland. The uniqueness of our cultural heritage and blended upbringing in an amalgamation of cultures. 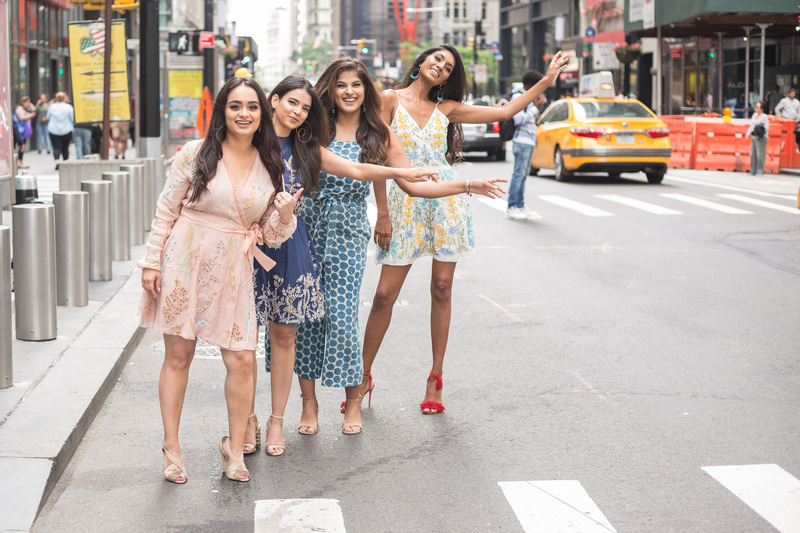 Brown Girl Magazine honors our collective experiences with an exclusive editorial in collaboration with Grassroot by Anita Dongre – this is the epitome of our South Asian-American hyphenated identities. We’ve never let our roots fade with the city’s hustle and bustle nor do we ever plan on letting them. 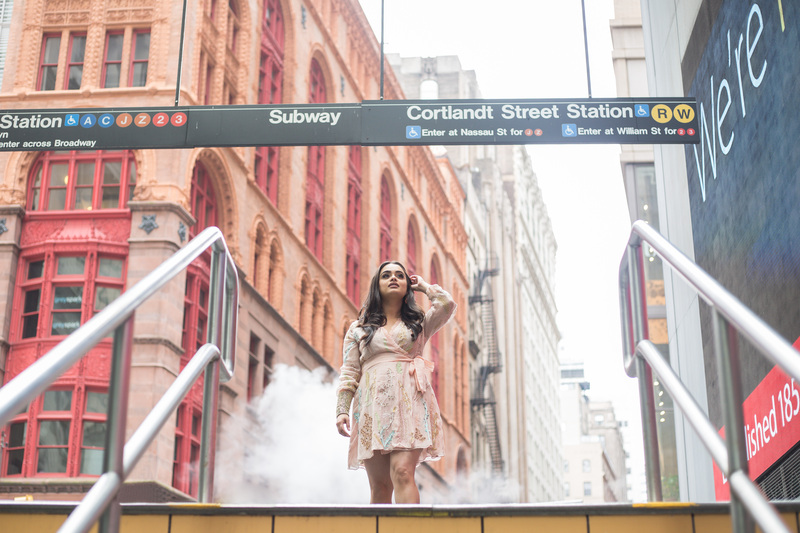 So, this photo campaign—shot downtown near the Freedom Tower—is us paying homage to the dichotomy of our lives in New York City and our countries of origin. Photos are courtesy of Pooja Dhar and makeup is courtesy of Armin. “I live and breathe New York City. 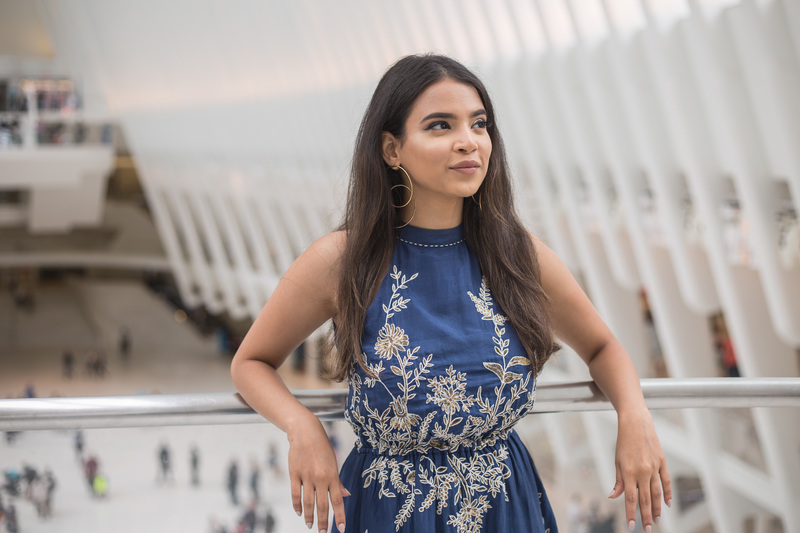 I may not know every nook and still have trouble finding my way on the subway, but I certainly feel at home no matter the borough, the restaurant, tourist attraction, lounge or cafe. The city’s vibes, the diverse food, its wild nightlife, the countless smells on every street corner, its culture, the hustle, everything about this city speaks to my soul. My drive to conquer the world comes from living here and nothing can replace it. I leave town for a few days, but the joy that comes with returning back home is a feeling I will never take for granted. Seeing the city’s skyline from my balcony in Long Island City day after day keeps me grounded – it reminds me of how small I am, yet somehow, the city continually gives me the opportunity to do more with my life. However, nothing in this city would be the same if my roots weren’t connected to every Halal cart, eyebrow threading salon, and yellow cab driver who has the thickest desi accent but knows exactly where to drop me off or the Uncle Ji who owns the bodega on the street corner and plays Bollywood music every day. India is truly in every part of the city, doesn’t matter where you go, you’ll find the feeling of home everywhere. 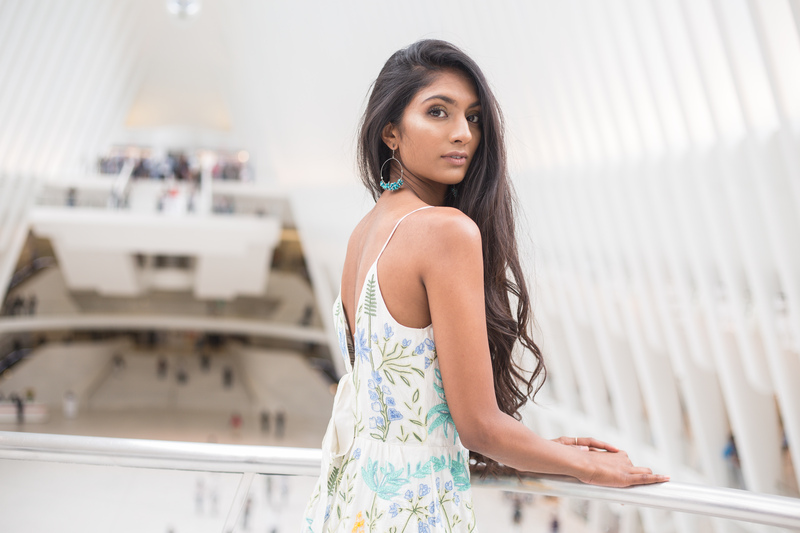 “I have been a New Yorker for the past 17 years and there have been many times throughout my years here that I have felt as though I have been transported back to India. It can honestly happen on a daily basis if you’re open to it! One way I connect with my South Asian heritage is by keeping decor in my home that reminds me of my roots. I have paintings that are in gorgeous jewel tones that speak to my colorful Punjabi culture, an Om symbol on my bookshelf and I am constantly starting my mornings by lighting an agarbatti (incense) my mom gave me from a temple. It might not be obvious to people around me but it’s a thread that weaves through everything I do and all that I am. I also use clothing and jewelry as a way to constantly connect with culture. Style is probably my favorite way of expressing my love for all things Indian. There can never be enough gold, fuschia or emerald green, and while I can’t justify wearing a full-on bridal lehenga every day (trust me, I’ve tried! ), I can find ways to incorporate these colors and beautiful details on any occasion. That’s why I completely fell in love with the Grassroot by Anita Dongre collection. 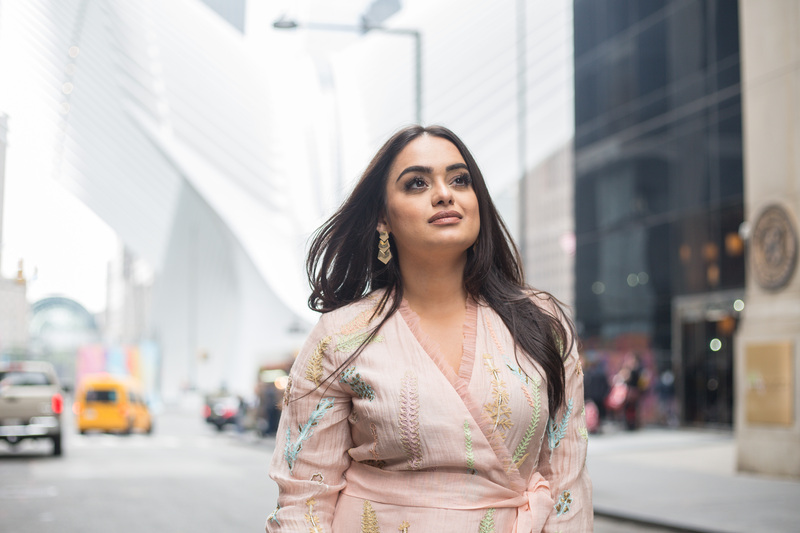 It merges everything I love about being Indian, and the clothing itself is filled with the comfort and ease you need while running around in New York City. While I embrace the traditions passed on from generations in my family, it’s equally as important to pave my own path and do things differently where it makes sense. 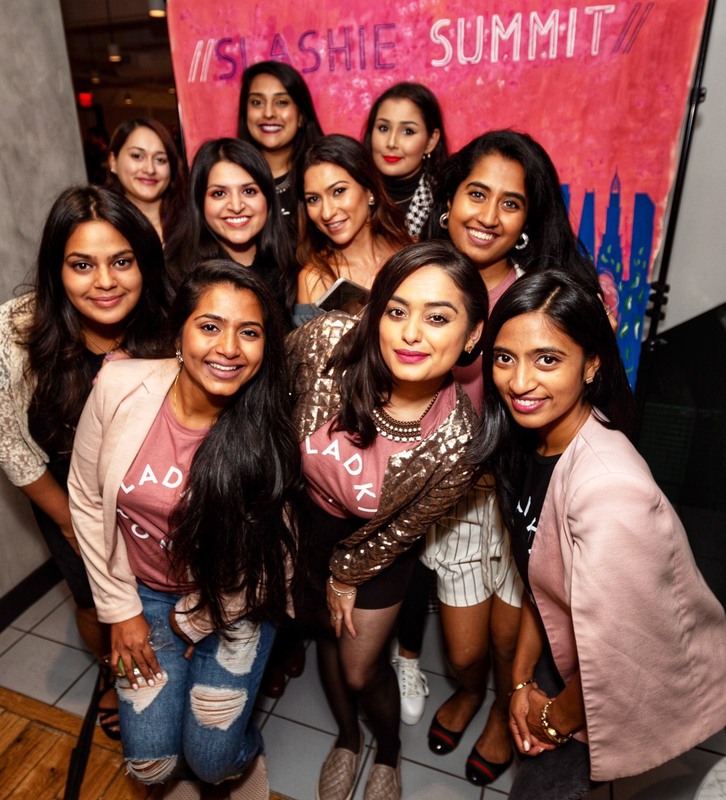 Being an entrepreneur as a South Asian woman is one of the ways I go against the traditional grain, and I am grateful for women like Anita who show me that it’s not only okay, it’s empowering. “I usually start my day sitting at a roundtable, in my New York City apartment, looking out the window. Right in front of me is the Empire State Building and in my hands is a cup of chai. That cup of chai means so much more than you can imagine though. Living in midtown Manhattan, it’s easy to get lost in the glittering rooftop bars and cozy cafes. But despite everything going on around me, something always inevitably transports me thousands of miles back home. Some days it’s that cup of chai that I start my morning with. Other days it’s wearing the earrings that I bought off a street vendor in the charming lanes of Delhi. Or the sustainable fabric dress I got at a luxury retail store, that was painstakingly block printed by hand. Whatever it may be, I always try to summon home to me, across thousands of miles, by wearing a piece of it wherever I go. 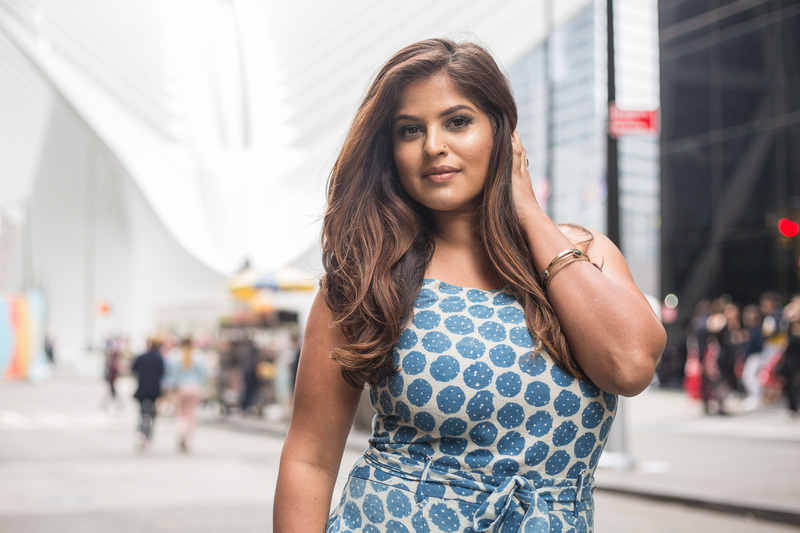 But working in the fashion industry in New York, it can be hard to express yourself and your South Asian roots. Whether it’s replacing that jacket at work with a Kashmiri shawl or styling a desi print with a Gucci bag, you really have to make an effort. I try hard not to let my environment suppress my roots or erase my identity. I’m constantly looking for ways to create a new identity that I’m comfortable with by blending my roots and surroundings. An identity that I can wear when I’m in a meeting with a fashion editor or when I’m hanging with my friends from back home. It can be difficult to navigate that path (and that closet!) but I adore Grassroot by Anita Dongre because it’s a gorgeous amalgamation of the two. It makes me feel equal parts true to my roots and equal parts trendy. It’s comfy enough to just grab a coffee in SoHo but stunning enough to hop from show to shop at New York Fashion Week. 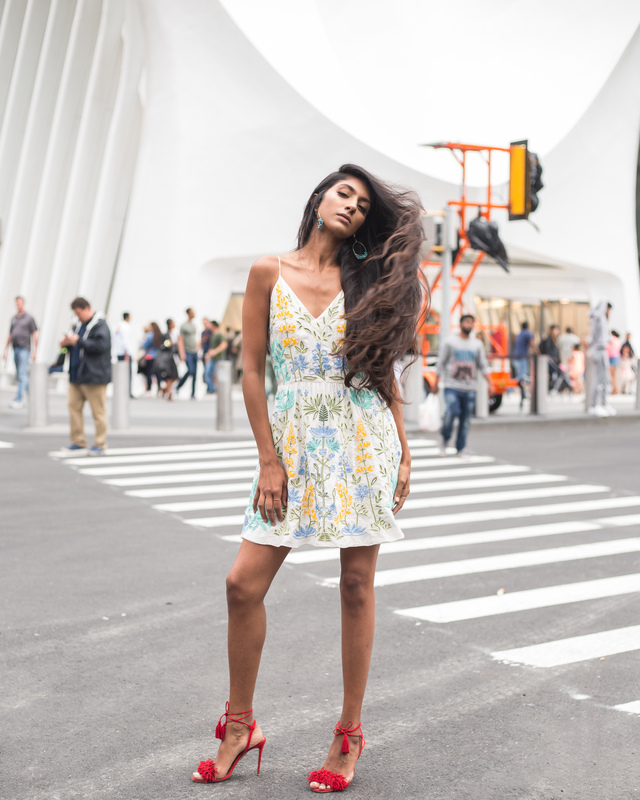 “I moved to New York City six months ago from London, through my modeling agency, and this is the first time I’ve ever lived in a different country away from my family and friends. As you can imagine, there are a plethora of things I miss but the one main thing I miss is my mum’s Indian cooking. I’m constantly ringing her about her recipes for Indian dishes that I miss so much – inevitably they just never taste as good as how she makes it. Since I’ve begun to cook more South Asian dishes at home, I’ve realized it’s my little way of staying connected, not only to my mum but also my culture. Being a model you are exposed to so many different things daily, not just fashion but travel too. These two things together have really shaped the way I look at my wardrobe and what represents me and my South Asian heritage. I’m often picking up accessories on my travels that have a strong Indian look and pairing them up with Western clothing and that’s why the Grassroot by Anita Dongre collection stole my heart. It has the perfect balance of Indian influences with Western silhouettes that completely checks all the boxes for clothing I like to wear. Her storefront in SoHo represents women in New York City who are very proud of their heritage and also loyal to the countries they were raised in. Grassroot by Anita Dongre is a contemporary platform created for the artisans of India. The objective is to nurture our treasure chest of handcrafted traditions by reviving, sustaining and empowering the arts and artisans by ensuring continuous work and creating livelihoods. The brand is a tribute to India’s handcrafted traditions and fashions them into contemporary tales. 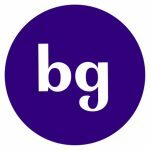 Grassroot is a luxury prêt brand that appeals to today’s evolved, sophisticated global woman who understands the value of slow fashion and has the fine taste to appreciate the legacy of craft by hand.